We are exposed to potential toxins, such as heavy metals, on a daily basis, no matter what we do. 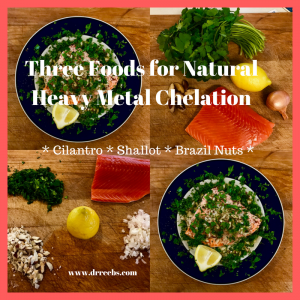 So why not also cook with foods that naturally help remove heavy metals from the body, a process known as chelation? 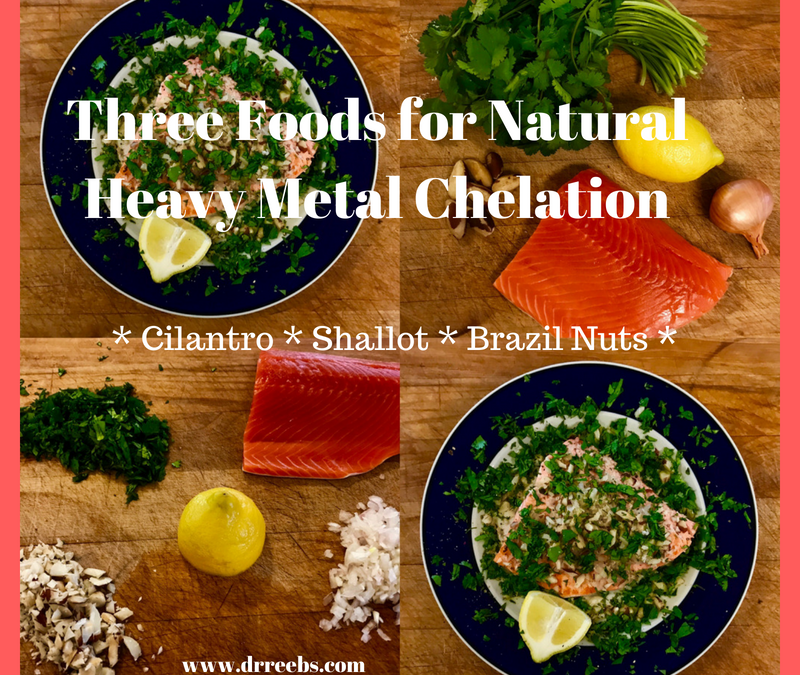 This article briefly discusses heavy metal toxicity in seafood as well as three foods for natural heavy metal chelation, then combines it altogether in a recipe! Seafood, and most prominently, fish, is not only an important source of protein, but also rich in essential minerals, vitamins, and unsaturated/essential fatty acids (EFAs). Yet it is just this nutrient-dense lipid content which can also pose the greatest harm. Hence, it’s critical to eat sustainably harvested seafood, such as those provided by Vital Source Seafood, an inspiring company that only supplies sustainability certified fish and seafood (Marine Stewardship Council (MSC), State of Alaska, or Monterey Bay Aquarium SeafoodWatch program certified), such as wild-caught Alaskan salmon and northwest Pacific seafood, for a fair price and delivered flash-frozen to your doorstep. 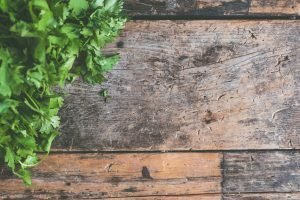 The most famous herb for chelating heavy metals from the body is cilantro/coriander, or Coriandrum sativum, which has been specifically shown to help remove mercury, lead, and aluminum from the tissues. (8) Not only that, but it’s an immune-boosting herb. So why not cook sustainably harvested seafood with naturally chelating herbs, and feed two birds with one seed?! 🙂 I decided to sear a filet of wild-caught Alaskan Coho salmon with some of the ingredients mentioned above, and it came out wonderfully. Fish and Omega-3 Fatty Acids. How Cigarettes Damage Your Body. 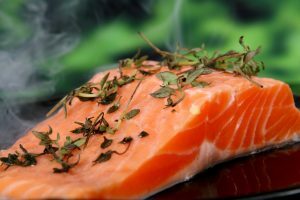 http://www.heart.org/HEARTORG/HealthyLiving/HealthyEating/HealthyDietGoals/Fish-and-Omega-3-Fatty-Acids_UCM_303248_Article.jsp#.W1c9fthKg_U. Accessed July 24, 2018. Menon S. Mercury Guide. NRDC. 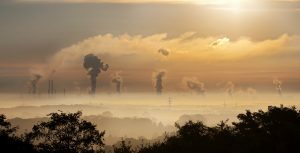 https://www.nrdc.org/stories/mercury-guide. Published January 9, 2018. Accessed July 24, 2018. What You Need to Know about Mercury in Fish and Shellfish. WebMD. https://www.webmd.com/diet/mercury-in-fish#1. Accessed July 24, 2018. Kohlstadt I. Fish, mercury, and personalized medicine. Townsend Letter: The Examiner of Alternative Medicine. June 2007. How Does Mercury Get Into Fish? Scientific American. https://www.scientificamerican.com/article/how-does-mercury-get-into/. Accessed July 24, 2018. El-Moselhy KM, Othman A, El-Azem HA, El-Metwally M. Bioaccumulation of heavy metals in some tissues of fish in the Red Sea, Egypt. Egyptian Journal of Basic and Applied Sciences. 2014;1(2):97-105. doi:10.1016/j.ejbas.2014.06.001. The Health Benefits of Cilantro. Dr. Group’s Healthy Living Articles. https://www.globalhealingcenter.com/natural-health/health-benefits-of-cilantro/. Published February 16, 2017. Accessed July 24, 2018. Negi, R., Satpathy, G., Tyagi, Y. K., & Gupta, R. K. (2012). Biosorption of heavy metals by utilising onion and garlic wastes. International Journal of Environment and Pollution, 49(3/4), 179. doi:10.1504/ijep.2012.050898. Ralston, N. V., & Raymond, L. J. (2010). Dietary selenium’s protective effects against methylmercury toxicity. Toxicology, 278(1), 112-123. doi:10.1016/j.tox.2010.06.004. It’s well known that vitamin C, B complex vitamins, glutathione, and N-acetyl Cysteine (NAC) play a large role in alcohol metabolism, but zinc is rarely mentioned. However, zinc is actually a requisite cofactor in the metabolism of alcohol. (1) Zinc has not been studied extensively as a treatment for alcoholism, though alcoholics are usually zinc deficient and suffer from conditions which may benefit from zinc supplementation, such as low sperm counts and rosacea. The body’s main enzyme for alcohol metabolism, alcohol dehydrogenase (ADH), actually contains zinc at its catalytic site. 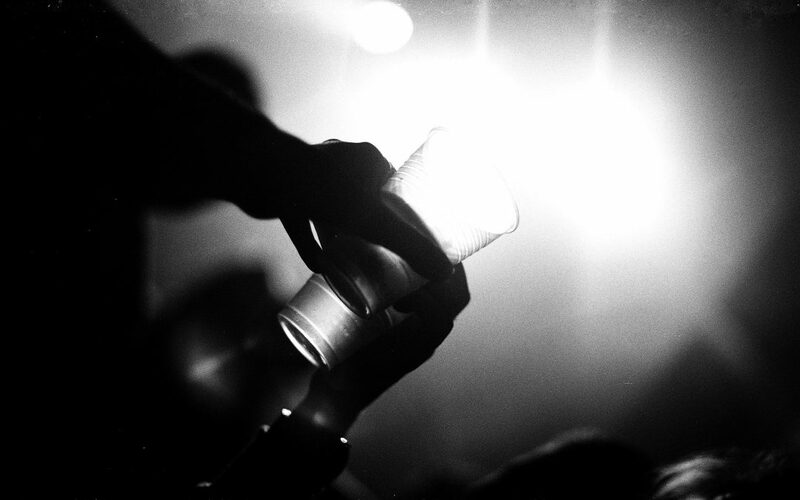 Zinc is now considered a novel therapeutic approach to alcohol liver disease (ALD). (2) ADH exists in decreased amounts in women, which contributes to less “first-pass metabolism,” and may in part explain why women are more susceptible to alcohol intoxication. Zinc, an essential trace element, goes hand-in-hand with protein intake; in other words, poor protein intake correlates with poor zinc status. (3) Some symptoms of zinc deficiency include poor growth, infertility, skin disease, and impaired immune function. Ethanol is the natural product of sugar fermentation by yeasts. According to the USDA, one standard drink contains about half an ounce of ethanol. This is the equivalent of a light 12 oz beer, a 5 oz pour of wine, or 1.5 oz of an 80-proof distilled liquor. Ethanol is found in many household products, such as mouthwash, perfume, and cooking extracts. The first and main system lies in the cytosol of hepatocytes, where alcohol dehydrogenase (ADH) transforms ethanol to acetaldehyde. As mentioned, the ADHs are actually are actually a class of zinc enzymes! The second involves CYPs which oxidize ethanol in the microsomes of cells, known as the microsomal ethanol-oxidizing system (MEOS). Microsomes are basically fragments of hepatocellular endoplasmic reticulum. The third involves catalase in the peroxisomes, which acts upon hydrogen peroxide as substrate, metabolizing no more than 5% of all liver ethanol. Ethanol crosses cell membranes, about 80% of its absorption occurring in the duodenum and 20% in the stomach itself. Peak blood ethanol levels are reached approximately 30 to 90 minutes after a meal. (6) Once ethanol reaches the blood, its taken up mainly by hepatocytes replete with ample quantities of ADH. ADH, however, is also available in the mucosa of the gut. 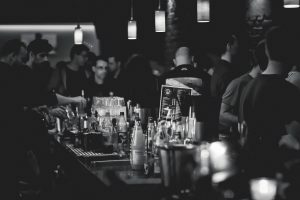 Given that the body’s main enzyme system responsible for metabolizing alcohol in the liver is zinc-based, there appears to be enough evidence to warrant further studies in zinc supplementation for alcohol-induced diseases. Alcohol dehydrogenase. Egyptian Journal of Medical Human Genetics. https://www.sciencedirect.com/topics/neuroscience/alcohol-dehydrogenase. Accessed July 17, 2018. Kharbanda K, Ronis M, Shearn C, et al. Role of Nutrition in Alcoholic Liver Disease: Summary of the Symposium at the ESBRA 2017 Congress. Biomolecules. 2018;8(2):16. doi:10.3390/biom8020016. Gibson RS. A Historical Review of Progress in the Assessment of Dietary Zinc Intake as an Indicator of Population Zinc Status. Advances in Nutrition. 2012;3(6):772-782. doi:10.3945/an.112.002287. Alcohol. World Health Organization. http://www.who.int/substance_abuse/facts/alcohol/en/. Published May 12, 2014. Accessed July 17, 2018. Alcohol Metabolism: An Update. National Institute on Alcohol Abuse and Alcoholism. https://pubs.niaaa.nih.gov/publications/aa72/aa72.htm. Accessed July 17, 2018. Mitchell MC, Teigen EL, Ramchandani VA. Absorption and Peak Blood Alcohol Concentration After Drinking Beer, Wine, or Spirits. Alcoholism: Clinical and Experimental Research. 2014;38(5):1200-1204. doi:10.1111/acer.12355. McClain CJ, Su LC. Zinc deficiency in the alcoholic: a review. Alcohol Clin Exp Res 1983;7:5-10. Skalny AV, Skalnaya MG, Grabeklis AR, Skalnaya AA, Tinkov AA. Zinc deficiency as a mediator of toxic effects of alcohol abuse. European Journal of Nutrition. 2017. doi:10.1007/s00394-017-1584-y. Liuzzi JP, Narayanan V, Doan H, Yoo C. Effect of zinc intake on hepatic autophagy during acute alcohol intoxication. BioMetals. 2018;31(2):217-232. doi:10.1007/s10534-018-0077-7. Studies show that cortisol, your body’s stress hormone, increases thyroid-stimulating hormone (TSH), (1,2) as well as inhibits the conversion of T4 to T3, which is your body’s metabolically active thyroid hormone (3,4). This process mostly occurs peripherally in the liver, GI tract, skeletal muscle, but also occurs in the thyroid and even the brain itself. However, we need more studies verifying exactly how elevated cortisol levels mechanistically inhibits T4-to-T3 conversion. But why would cortisol inhibit T3 from being formed? Because T3 requires a lot of energy or ATP, to get stuff done in the body, and when the body is stressed, it needs to conserve energy so that it can act out of fight or flight. What this basically means is that when your blood sugars are low, a stress response is mimicked in your body. 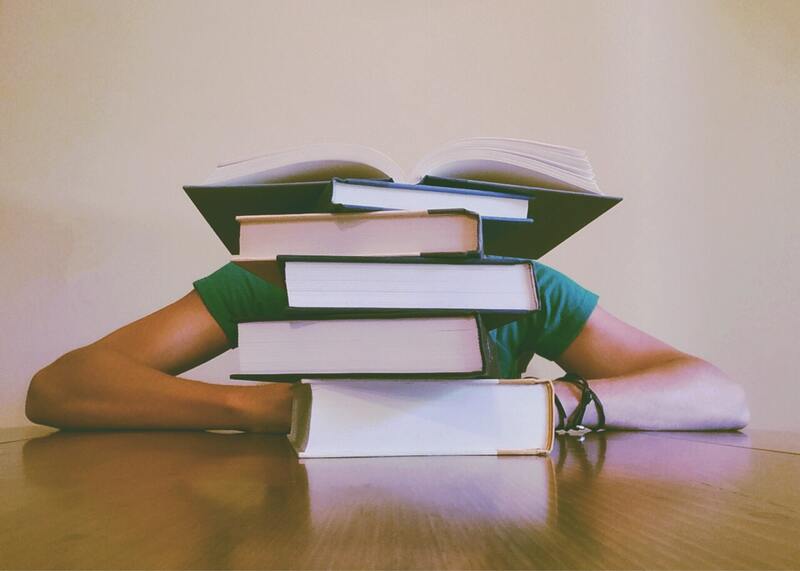 Stress is a complex phenomenon which can be physical or psychological. Some examples of stressful events which are physical in nature include trauma, infection, or exercise. We already mentioned hypoglycemia. Psychological examples of stress include fear, bereavement, or anger. Did you know that cortisol is the only hormone in the body that has receptors on almost every cell. It must be pretty important then. And that’s why it goes everywhere, having no particular affinity for anything. There’s a word for this in science: Permissive. (7) When you’re superstressed, all of these cortisol receptors get upregulated, increasing cellular sensitivity. And there is no cellular second messenger, in case you were wondering. The message of cortisol is loud and direct. Proteolysis and Gluconeogenesis: Cortisol breaks down proteins, a process called proteolysis, so that the amino acids can be used to make glucose (gluconeogenesis). Remember, the body is in a state of hypoglycemia. Stress Lowers Your Immune System: Cortisol wields profound anti-inflammatory effect across the body. Cortisol destroys white blood cells, such as T-cells and eosinophils. Cortisol inhibits the migration of pathogen-engulfing, debris-cleaning macrophages. Cortisol stabilizes mast cells, who can be quite annoying when they unload histamine, as in Type 1 hypersensitivity reactions, such as seasonal allergies. Cortisol also inhibits an enzyme called phospholipase, which is responsible for making prostaglandins by cleaving the phospholipid bilayer in the cell’s membranes and releasing arachidonic acid, which signals the body to make a host of important inflammatory molecules required by the immune system to do its job. (8) Remind you of the effects of steroids, by chance? Well, that’s because cortisol is an endogenous steroid. Too much cortisol can lead to immunosuppression. (9) And when your immune system is down, that’s when you get sick. Ever get done with school finals for the term, only to be sick during your week off? Well, this is why. 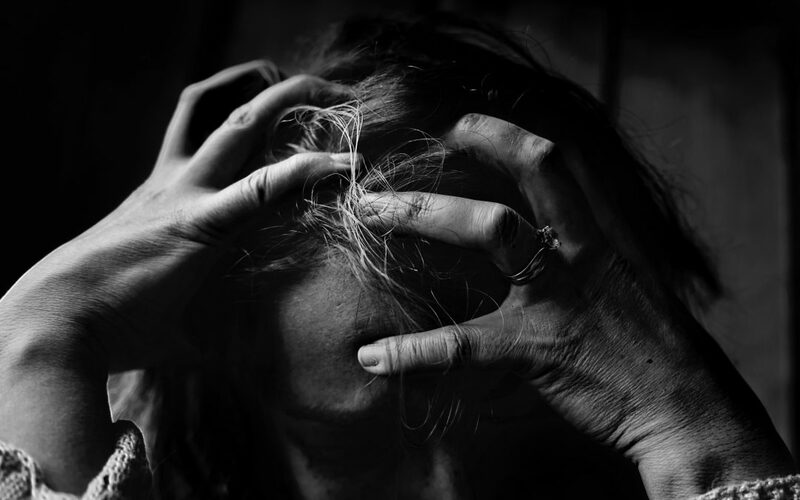 When you experience a stressful event, such as an important exam, a romantic breakup, or a fender-bender, a cascade of hormones (10) are released in the engine of your body over approximately twenty-four hours. Epinephrine: First and immediately after the stressful event, epinephrine, aka adrenaline, is released. Epinephrine increases heart rate, raises blood sugar, and boost sugar metabolism. Glucagon: After about 20 minutes, glucagon is released from the alpha cells of the pancreas, causing blood sugar to be raised, as well as glycogen to be broken down (glycogenolysis), fats to be broken down (lipolysis), and ketones to be made (ketogenesis). Glucagon acts on the adrenal cortex, as well as the liver and adipose tissue. Cortisol: Within about 2 to 4 hours, cortisol is released. Growth Hormone: Then, after about 24 hours, growth hormone (GH) is released. This is one reason that high intensity interval trainings (HIIT), such as CrossFit, is effective for muscle growth, which doesn’t occur until one gets good sleep and after a couple days, because workouts are fast-paced and stressful. GH raises glucose levels and breaks down fat, releasing free fatty acids, produced by the anterior pituitary when we sleep. 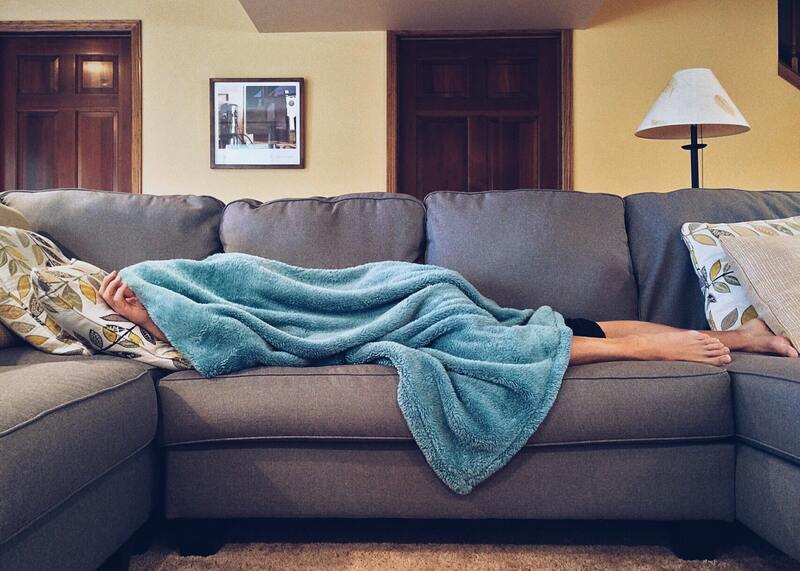 This is why a good night’s sleep is critical to get the benefits of HIIT. Insulin: Here’s one thing that’s a bit counterintuitive. Almost every metabolic process in the body is biphasic, balanced and counterbalanced by opposing regulatory feedback mechanisms. The hormones mentioned above will produce glucose in the body, which will increase the osmolarity of the blood. But after about 30 minutes, the body will release insulin, in order to push the excess glucose into the cells so that it can be used. Antidiuretic Hormone (ADH): After about 30 minutes, the body will also produce antidiuretic hormone (ADH), in order to normalize the blood osmolarity by retaining fluid volume rather than diuresing (a fancy word for urinating). Aldosterone: Cortisol works alongside the hormone aldosterone, as well, to increase sodium reabsorption in the kidneys, so that electrolyte and hydration status are appropriately maintained. As at least half of our blood is water, proper blood perfusion can occur in the body during fight or flight. Cortisol, your body’s stress hormone, inhibits the conversion of T4 to T3, that is, your body’s metabolically active thyroid hormone. If high cortisol levels are chronic, this can lead to hypothyroidism. Cortisol is the body’s endogenous corticosteroid, suppressing the immune system. Chronic stress can lead to frequently getting sick. Walter KN, Corwin EJ, Ulbrecht J, et al. Elevated thyroid stimulating hormone is associated with elevated cortisol in healthy young men and women. Thyroid Research. 2012;5(1):13. doi:10.1186/1756-6614-5-13. Hage MP, Azar ST. The Link between Thyroid Function and Depression. Journal of Thyroid Research. 2012;2012:1-8. doi:10.1155/2012/590648. Szivak TK, Lee EC, Saenz C, et al. Adrenal Stress and Physical Performance During Military Survival Training. Aerospace Medicine and Human Performance. 2018;89(2):99-107. doi:10.3357/amhp.4831.2018. Kahana L, Keidar S, Sheinfeld M, Palant A. Endogenous Cortisol And Thyroid Hormone Levels In Patients With Acute Myocardial Infarction. Clinical Endocrinology. 1983;19(1):131-139. doi:10.1111/j.1365-2265.1983.tb00751.x. Ranabir S, Reetu K. Stress and hormones. Indian Journal of Endocrinology and Metabolism. 2011;15(1):18. doi:10.4103/2230-8210.77573. Gandhi K. Approach to hypoglycemia in infants and children. Translational Pediatrics. 2017;6(4):408-420. doi:10.21037/tp.2017.10.05. Mavroudis PD, Corbett SA, Calvano SE, Androulakis IP. Circadian characteristics of permissive and suppressive effects of cortisol and their role in homeostasis and the acute inflammatory response. Mathematical Biosciences. 2015;260:54-64. doi:10.1016/j.mbs.2014.10.006. Goppelt-Struebe M, Wolter D, Resch K. Glucocorticoids inhibit prostaglandin synthesis not only at the level of phospholipase A2 but also at the level of cyclo-oxygenase/PGE isomerase. British Journal of Pharmacology. 1989;98(4):1287-1295. doi:10.1111/j.1476-5381.1989.tb12676.x. Coutinho AE, Chapman KE. The anti-inflammatory and immunosuppressive effects of glucocorticoids, recent developments and mechanistic insights. Molecular and Cellular Endocrinology. 2011;335(1):2-13. doi:10.1016/j.mce.2010.04.005. Relying mainly on observational studies, there are many proposed mechanisms by which coffee may increase longevity and protect against cognitive decline, such as antioxidant capacity, increased insulin sensitivity, and the anti-inflammatory effects of blocking adenosine receptors in the brain. (5,6) This article will explore a potential mechanism which is little talked about, accounting for the gut-brain axis which links emotional and cognitive areas of the brain with intestinal functions. Coffee, both caffeinated and decaffeinated (7,8), increases the production of the hormone gastrin in the gut (9), the prime regulator of gastric acid (HCl) secretion. Specialized endocrine cells (G cells) release gastrin into circulation after a meal. The G cells are tightly regulated by two hormones: gastrin releasing peptide (GRP), which exerts stimulatory effects in the gut and is countered by the inhibitory effects of somatostatin. The release of gastrin is controlled by a negative feedback loop whereby fasting and increased stomach acid will inhibit it and a high gastric pH will stimulate its secretion. 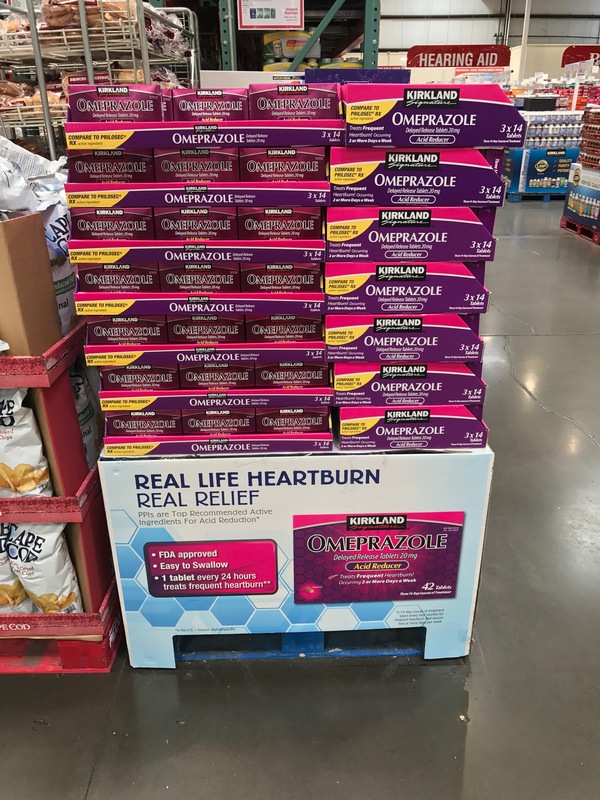 This may partially explain why long-term proton pump inhibitor (PPI) takers often have chronically elevated serum gastrin levels. PPIs inhibit the H+/K+-ATPase system found in gastric parietal cells, thereby suppressing gastrin levels, which will eventually cause the body to respond to stimulate the release of gastrin to maintain homeostasis. Low stomach acid (hypochlorhydria) is more common in the elderly (11). 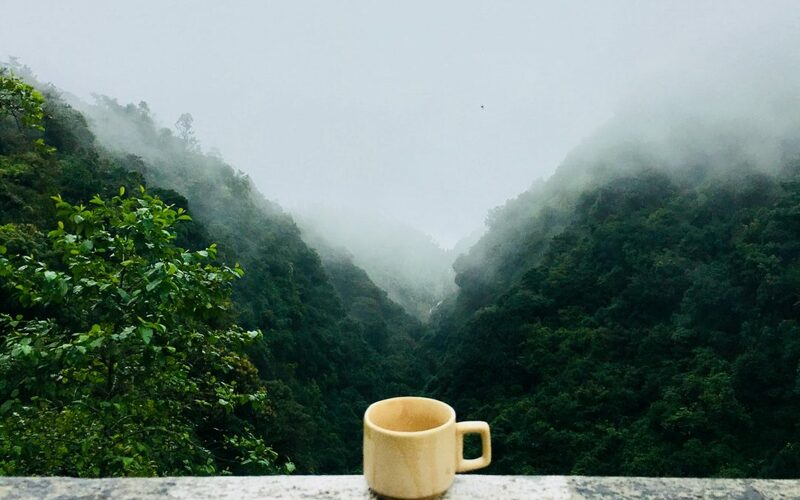 Is it possible that coffee’s life-lengthening health benefits are in part due to its effect on gastric parietal cells, helping to maintain optimal pH levels and a healthy microbiome, as well as optimize digestion and nutrient absorption. This may very well be the main reason that coffee consumption, no matter in what form, increases longevity. Unfortunately, more observational studies will not give us the answer. Drinking coffee may be associated with reduced risk of heart failure and stroke. Late-onset asthma linked to increased heart disease, stroke risk | American Heart Association. https://newsroom.heart.org/news/drinking-coffee-may-be-associated-with-reduced-risk-of-heart-failure-and-stroke. Accessed July 3, 2018. Santos C, Costa J, Santos J, Vaz-Carneiro A, Lunet N. Caffeine Intake and Dementia: Systematic Review and Meta-Analysis. Journal of Alzheimers Disease. 2010;20(s1). doi:10.3233/jad-2010-091387. Panza F, Solfrizzi V, Barulli MR, et al. 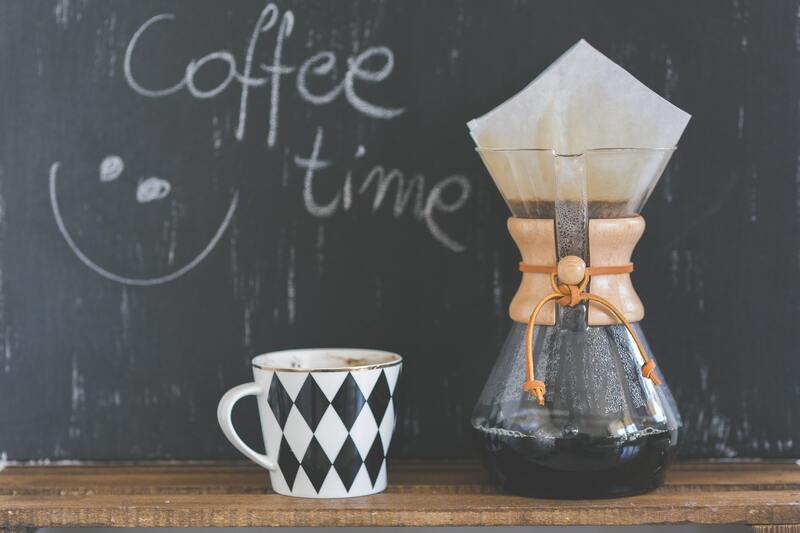 Coffee, tea, and caffeine consumption and prevention of late-life cognitive decline and dementia: A systematic review. The journal of nutrition, health & aging. 2014;19(3):313-328. doi:10.1007/s12603-014-0563-8. Eskelinen MH, Kivipelto M. Caffeine as a Protective Factor in Dementia and Alzheimers Disease. Journal of Alzheimers Disease. 2010;20(s1). doi:10.3233/jad-2010-1404. Chiu GS, Chatterjee D, Darmody PT, et al. Hypoxia/Reoxygenation Impairs Memory Formation via Adenosine-Dependent Activation of Caspase 1. Journal of Neuroscience. 2012;32(40):13945-13955. doi:10.1523/jneurosci.0704-12.2012. Feldman EJ. Gastric Acid and Gastrin Response to Decaffeinated Coffee and a Peptone Meal. JAMA: The Journal of the American Medical Association. 1981;246(3):248. doi:10.1001/jama.1981.03320030040027. Deventer GV, Kamemoto E, Kuznicki JT, Heckert DC, Schulte MC. Lower esophageal sphincter pressure, acid secretion, and blood gastrin after coffee consumption. Digestive Diseases and Sciences. 1992;37(4):558-569. doi:10.1007/bf01307580. P. J. Boekema, M. Samsom, G. P. Van Be. Coffee and Gastrointestinal Function: Facts and Fiction: A Review. Scandinavian Journal of Gastroenterology. 1999;34(230):35-39. doi:10.1080/003655299750025525. Liszt KI, Ley JP, Lieder B, et al. Caffeine induces gastric acid secretion via bitter taste signaling in gastric parietal cells. Proceedings of the National Academy of Sciences. 2017;114(30). doi:10.1073/pnas.1703728114. Russell RM. Gastric hypochlorhydria and achlorhydria in older adults. JAMA: The Journal of the American Medical Association. 1997;278(20):1659-1660. doi:10.1001/jama.278.20.1659. 1. Purification. Another name for purification is detoxification. There’s an old word for toxicity in the blood, toxemia, which according to Henri Lindlahr, M.D., one of the founders of naturopathic medicine, is caused by the violations of nature’s laws, and is equivalent with disease. 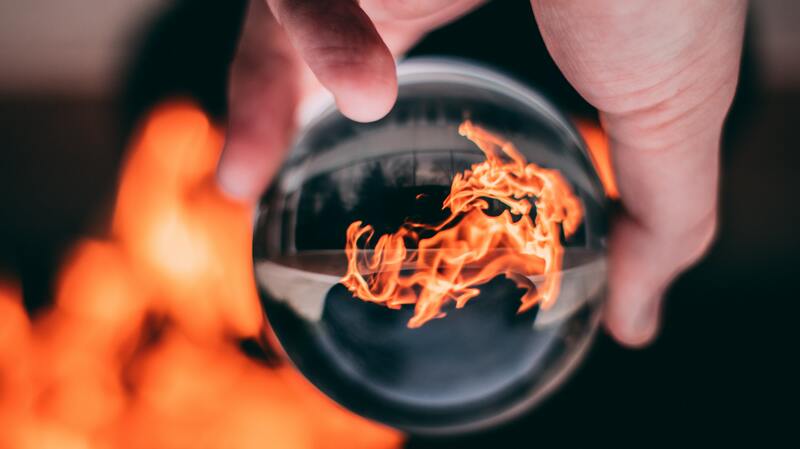 (1) In this article, we may gloss over some of these laws, but if you want to learn more about them, check out The Naturopathic Medicine Institute. 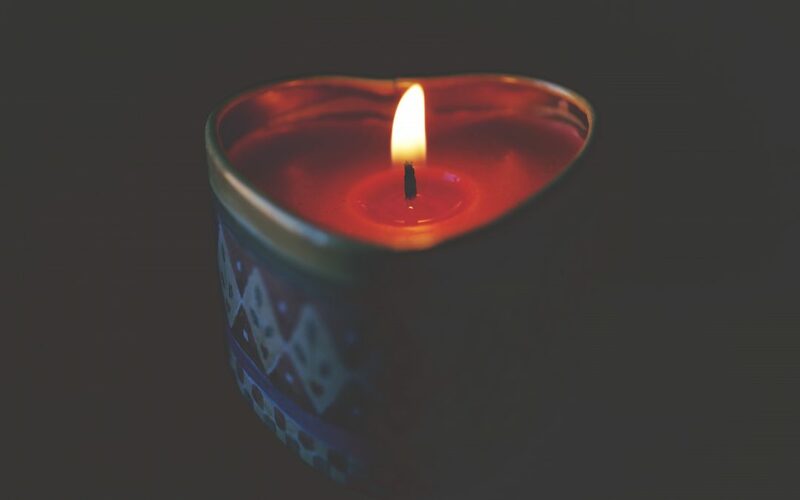 According to traditional naturopathy, toxemia can be primarily reduced via sweat (skin), solid waste (intestines), liquid waste (kidney and urinary bladder), and gaseous waste (lungs). Interestingly, one feature these five emunctories share in common is ample epithelial tissue, which in part serves a defense function immunologically. (2) In the skin, epithelium connects via ducts to sweat glands, a type of exocrine gland which can remove pthalates, BPA, and even toxic metals from the body. 2. Pura Vida. This is the opposite of la vida loca, which induces stress. We know the expression of pura vida as the law of the land in Costa Rica, but at it’s core it really means living a pure life by reducing one’s exposure, as much as possible, to toxic substances, environments, and even thoughts. And yes, this means getting rid of processed sugar and industrial vegetable oils, because of the inflammatory byproducts they produce in our bodies. Because of epigenetics, as expounded upon by the likes of molecular biologist Bruce Lipton, we now know that we literally are what we eat, breathe, and think, and of course, as we follow food chains, we are what we eat ate, too. Pura vida speaks for itself, but for illustrative purposes I’d like to briefly talk about the effects of stress on the gut. We have microvilli which comprise the brush border and extend into the lumen of our small intestine, responsible for nutrient absorption from our food breakdown. (4) Sloughed every seven days, these microvilli contain arteriovenous (AV) connections which provide necessary blood supply when closed, but in times of stress, the hormones epinephrine and norepinephrine open the AV connections and the microvilli lose their blood supply as blood is shunted away from the gut (think fight or flight). As a result, the microvilli cannot survive and lose their absorptive surface, temporarily inducing malabsorption. This is particularly pronounced after, for example, a severe stress-inducing trauma, such as a car accident, as it may take two or three days for the dead microvilli to slough and fully regenerate. It can be said then that chronic stress will induce chronic malabsorption and/or malnutrition. 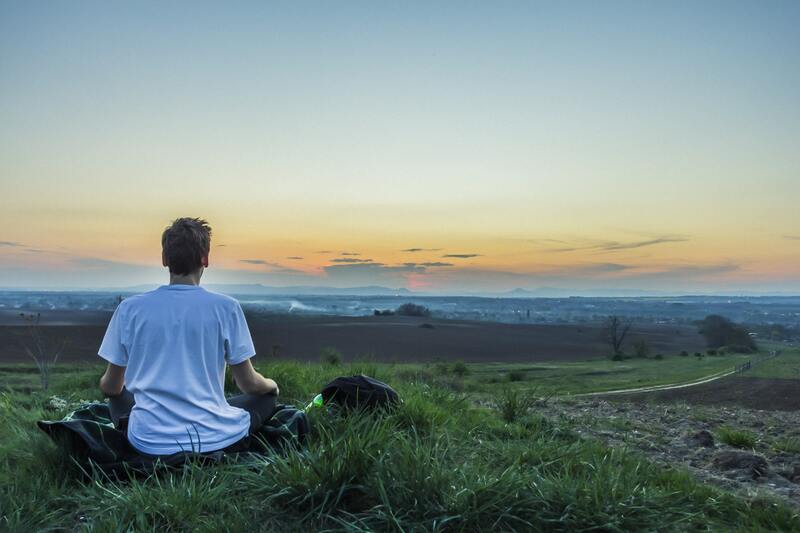 We all know about “rest and digest,” which occurs when the parasympathetic nervous system is activated and we are not pumping out cortisol and adrenaline into our bloodstreams. It is just this relaxing state that we need to cultivate in order for pura vida to truly take hold in our lives, so that our digestion and nutrient absorption is optimized. Biohack 2: When you’re feeling particularly toxic or maybe you’ve binged on that pizza and beer that you’d been craving, or maybe you’re traveling for business and can’t help but eat less nutrient-dense food along the way, keep some activated charcoal or digestive enzymes on hand. 3. Probiotics. 70% of our immune cells reside in the gut (5), and the highest density all-natural, bacterial ecosystem in the world is inhabited by our 100-trilliion celled gut microbiome. Our gut bacteria ferment fiber or collagen protein in the colon, producing short-chain fatty acids (SCFA), which are the main source of energy for superficial colonic cells. The most common (and famous) SCFA is butryic acid, which densely resides in grass-fed butter, such as Kerrygold. It’s well established that allergies and asthma are illnesses most likely caused by diminished gut function and a compromised microbiome. (11) Oh, and your gut microbiota make vitamin B12 (12), an essential nutrient for making red blood cells, proper neurological function, and DNA synthesis. And 75% of your vitamin K is produced in the microbiome, which helps our blood clot and can keep us from bleeding excessively. Biohack 3: Take a probiotic daily, and eat fermented, probiotic-rich foods. 4. Prebiotics. Prebiotics are nondigestible food ingredients that help promote beneficial intestinal microbiomic growth, in particular fiber compounds. Like other high-fiber foods, prebiotic substances pass through the upper GI, remaining undigested until they arrive in the colon. 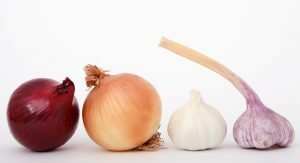 Prebiotics are rich in foods such as garlic and onions, Jerusalem artichokes, jicama, chicory root, and even dandelion greens. In the colon, prebiotic compounds are fermented microbiomically. 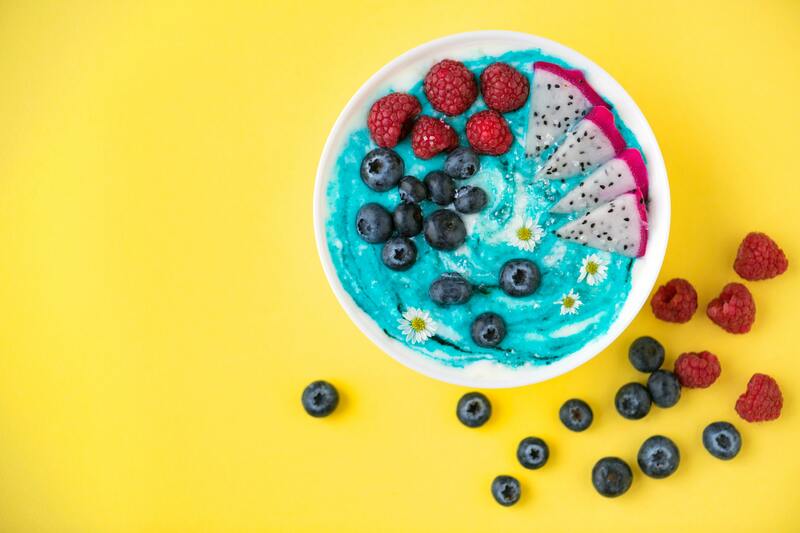 The most famous type of fiber prebiotic are oligosaccharides, but when researchers refer to fiber, they also mean fructo-oligosaccharides, polysaccharides, and even inulin. Some carbs rich in prebiotics include sweet potatoes, carrots (I prefer the non-orange ones, which have a lower glycemic load, such as polyphenol purple! We’ll talk more about the power of purple soon! ), squash, and asparagus. Then, there are also the resistant starches, so named because they are resistant to digestion, which further promote fermentation and help produce SCFAs like butyrate. Some resistant starches include banana flour, plaintain flour, and raw potato starch. Biohack 4: Eat prebiotic-rich foods, such as those listed above. Biohack 5: Eat purple polyphenols, such as those listed above! 6. Proline and lysine. Did you know that in the lumen (inner part or tube) of your gut, the amino acids proline and lysine are hydroxylated (a fancy chemical word for the addition of an -OH group to a molecule), with the help of the cofactor Vitamin C, to make collagen?! (17) Pretty amazing, right? It means these nutrients are essential for gut tissue regeneration, which is occurring 24/7. Other nutrients required include L-glutamine and butyric acid. Oh, and a couple of excellent demulcent herbs that aid in gut healing are slippery elm (Ulmus rubra), deglycyrrhizinated licorice (Glycyrrhiza glabra or DGL), and marshmallow root (Althaea officinalis). Another interesting tidbit: Vitamin C is a strong antioxidant, particularly in lowering antioxidant stress in the gut. (18) Apparently Eskimos got plenty of proline and lysine, as seal and whale contain high amounts, but we should probably hold off on eating them. Biohack 6: Eat plenty of seaweed (an incredibly rich source of proline and lysine). 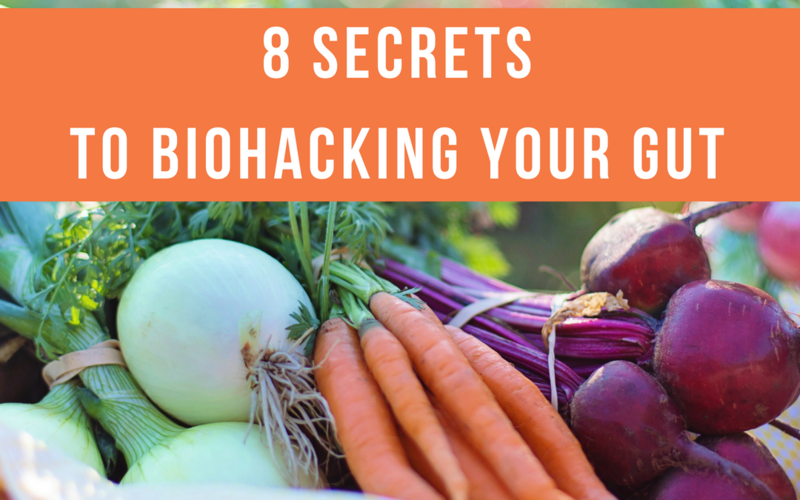 Biohack 7: Because studies have shown that stomach acid decreases with age, some natural means to stimulate the production of stomach acid, thereby improving fat breakdown and protein digestion, include betaine HCl and digestive bitters. Biohack 8: Deep belly breathing, regularly, on 4 to 8 counts at a time, can not only stimulate the will to action, but the fires of digestion. So, to recount the 8 P’s for biohacking the gut: Purify, live Pura Vida, eat a probiotic-, prebiotic-, polyphenol-, and proline- and lysine-rich diet, maintain proper pH or stomach acid, and find and live your life purpose, thereby firing your solar plexus on all cylinders. And make it #naturopathic. By the way, consult your doctor first if you are considering trying any of these therapies. In no way does this blog consist of medical advice. 1. Lindlahr, Henry 1862-1924., “Nature cure: philosophy and practice based on the unity of disease and cure” (1922). Naturopathic Medicine Historical Collection. 2. Janeway C. Immunobiology: the immune system in health and disease. London: Harcourt Brace & Company; 1999. 3. Laukkanen T, Khan H, Zaccardi F, Laukkanen JA. Association Between Sauna Bathing and Fatal Cardiovascular and All-Cause Mortality Events. JAMA Internal Medicine. 2015;175(4):542. 4. Tortora GJ, Derrickson B. Principles of anatomy and physiology. New York: Wiley; 2006. 5. Vighi, G., Marcucci, F., Sensi, L., Di Cara, G. and Frati, F. (2008), Allergy and the gastrointestinal system. Clinical & Experimental Immunology, 153: 3–6. 6. Musso G, Gambino R, Cassader M. Obesity, Diabetes, and Gut Microbiota: The hygiene hypothesis expanded? Diabetes Care. 2010;33(10):2277-2284. 7. gshatyan L, Kashtanova D, Popenko A, et al. Gut microbiota and diet in patients with various glucose tolerance. Endocrine Abstracts. 2016. 8. Campbell AW. Autoimmunity and the Gut. Autoimmune Diseases. 2014;2014:152428. 9. Gonzalez A, Hyde E, Sangwan N, Gilbert JA, Viirre E, Knight R. 2016. Migraines are correlated with higher levels of nitrate-, nitrite-, and nitric oxide-reducing oral microbes in the American Gut Project Cohort. mSystems 1(5):e00105-16. 10. Mosca A, Leclerc M and Hugot JP (2016) Gut Microbiota Diversity and Human Diseases: Should We Reintroduce Key Predators in Our Ecosystem? Front. Microbiol. 7:455. 11. Riiser A. The human microbiome, asthma, and allergy. Allergy, Asthma, and Clinical Immunology : Official Journal of the Canadian Society of Allergy and Clinical Immunology. 2015;11:35. 12. Degnan PH, Taga ME, Goodman AL. Vitamin B12 as a modulator of gut microbial ecology. Cell metabolism. 2014;20(5):769-778. 13. Pizzorno JE, Murray MT. Textbook of natural medicine. St. Louis, MO: Elsevier/Churchill Livingstone; 2013. 14. Tomás-Barberán F. Interaction of polyphenols with gut microbiota: Role in human health. Planta Medica. 2014;80(16). 15. Duda-Chodak A, Tarko T, Satora P, Sroka P. Interaction of dietary compounds, especially polyphenols, with the intestinal microbiota: a review. European Journal of Nutrition. 2015;54(3):325-341. 16. Rastmanesh R. High polyphenol, low probiotic diet for weight loss because of intestinal microbiota interaction. Chemico-Biological Interactions. 2011;189(1-2):1-8. 17. Murad S, Grove D, Lindberg KA, Reynolds G, Sivarajah A, Pinnell SR. Regulation of collagen synthesis by ascorbic acid. Proceedings of the National Academy of Sciences of the United States of America. 1981;78(5):2879-2882. 18. Alzoghaibi MA. 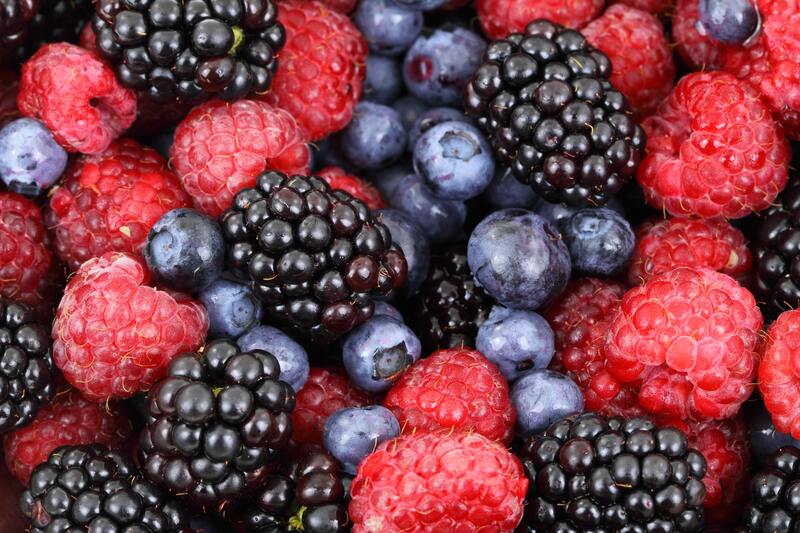 Concepts of oxidative stress and antioxidant defense in Crohn’s disease. World Journal of Gastroenterology : WJG. 2013;19(39):6540-6547. 19. Yano JM, Yu K, Donaldson GP, et al. Indigenous bacteria from the gut microbiota regulate host serotonin biosynthesis. Cell. 2015;161(2):264-276. 20. Heijboer, A. C., Pijl, H., Van den Hoek, A. M., Havekes, L. M., Romijn, J. A. and Corssmit, E. P. M. (2006), Gut–Brain Axis: Regulation of Glucose Metabolism. Journal of Neuroendocrinology, 18: 883–894. The Myth of GERD: It’s Not the Acid, Stupid! There is a myth that GERD, popularly known as heartburn, is due to having too much stomach acid, a condition known as hyperchlorhydria. But there is ample research (1,2,3,4) demonstrating the opposite is true, that is, that GERD is most likely due to not having enough stomach acid. Lower esophageal sphincter (LES) tone is reduced and so the LES relaxes when there is not enough acid in the stomach, a condition known as hypochlorhydria. Hence, the sphincter does not close properly and acidic contents are much more likely to reflux upward from the upper GI into the esophagus. Interestingly, the hypochlorhydria theory of GERD, proponents of which include Jonathan Wright, M.D., author of Why Stomach Acid is Good for You (2001), has been called an alternative medicine theory, when it’s actually grounded in basic med school physiology. To treat GERD, modern medicine prescribes drugs first-line in the on-average 7-minute visit: antacids like Tums which neutralize stomach acid; and H2 blockers like Tagamet and proton pump inhibitors (PPI’s) like Prilosec, that temporarily turn off our stomach’s ability to produce stomach acid. But turning off stomach acid in response to gastric reflux is the equivalent of an auto mechanic pulling the automotive fuse for your sudden dashboard engine warning light, or worse yet, simply cutting the wiring which carries the signal, because it is bothersome and annoying, rather than troubleshooting to find the underlying cause. Common sense tells us there will be downstream consequences for the life of any car (in medicine, these are known as sequelae) if any engine light warning goes unheeded for long enough. Stomach pH varies from roughly 1.5 (more acidic: normal fasting) to 3.5 (less acidic: with food), and proper pH is essential to breaking down proteins as well as a healthy microbiome (5). Our use of drugs to treat GERD is supposed to be short-lived (for example, an initial course of PPI’s is supposed to last no more than 8 weeks), but millions of people end up dependent on these drugs for years, and even decades. And weaning off these drugs, particularly PPI’s, can be challenging. There is an ample body of research now linking chronic PPI use to osteoporosis, increased infection risk, magnesium deficiency, and depression and dementia. But PPI’s are blockbuster drugs, as the market is projected to generate $4.34 billion by 2025. More than 80 million experience GERD symptoms in the U.S. alone. 25 million suffer from heartburn daily in the U.S. alone. 60 million suffer from heartburn monthly in the U.S. alone. Also, there is evidence that the body upregulates stomach acid production when it is blocked, because the body is smart enough to know that without proper stomach acid it will essentially starve. Having too much stomach acid, a condition known as hyperchlorhydria, is actually rare, seen in cases such as Zollinger-Ellison Syndrome (ZES), where tumors in your pancreas produce excessive amounts of gastrin, which leads to excessive stomach acid and thereby causes stomach ulcers. HCl production declines significantly with age, and GERD onset presents on average at age 50, another fact suggesting that GERD is due to hypochlohydria. Though GERD can be due to a number of causes, such as stress, hiatal hernia, or ZES, it is most likely that it is due to not having enough stomach acid. 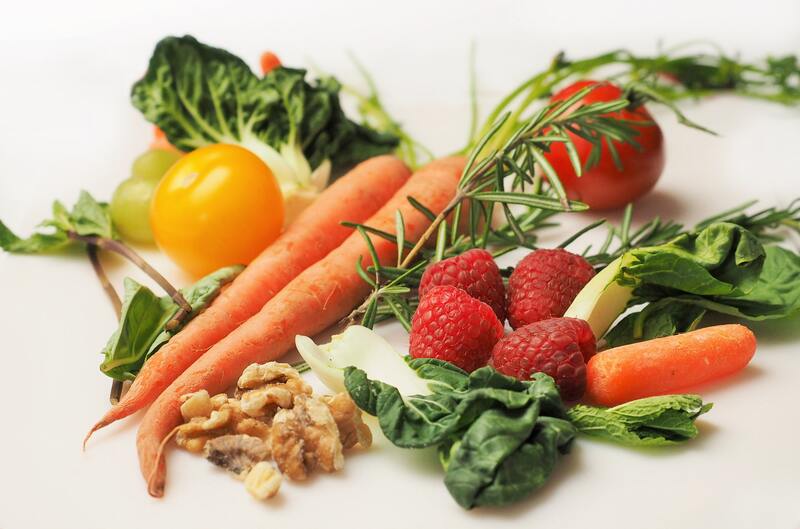 In naturopathic medicine, we treat the whole person and usually that begins with diet and lifestyle, but people need to be met where they are at. The innate healing mechanism of the body needs to be stimulated and obstacles to cure need to be eliminated for symptoms to improve. For people who have symptoms of GERD, it is important to determine if they are hypochlorhydric and if so, then to stimulate the production of stomach acid, so that not only can the lower esophageal sphincter maintain proper tone so that it remains closed when it’s supposed to, but so that healthy flora are maintained in the gut and digestion and absorption is optimized. Of course a person must consult their doctor before engaging in any medical treatment. Ayazi S, Leers, JM, Oezcelik A, Abate E, et al. Measurement of gastric pH in ambulatory esophageal pH monitoring. Surg Endosc. 2009 Sep;23(9):1968-73. Giles GR, Humphries C, Mason C, Clark G, et al. Effect of pH changes on the cardiac sphincter. Gut 1969;10:852-856. Kaye MD. On the relationship between gastric pH and pressure in the normal human lower oesophageal sphincter. Gut 1979;20:59-63. Giles GR, Mason MC, Humphries C, and Clark CG. Action of gastrin on the lower oesophageal sphincter in man. Gut 1969;10:730-734. Shreiner AB, Kao JY, and Young BV. The gut microbiome in health and disease. Curr Opin Gastroenterol. 2015 Jan;31(1):69-75. Dr. Ben is a naturopathic doctor who specializes in helping his patients and clients to restore & optimize health & vitality as well as prevent disease. Dr. Ben (“Abendigo”) Reebs, N.D.